Executive Oceanfront Home on the Northridge of Playa Flamingo with private beach. 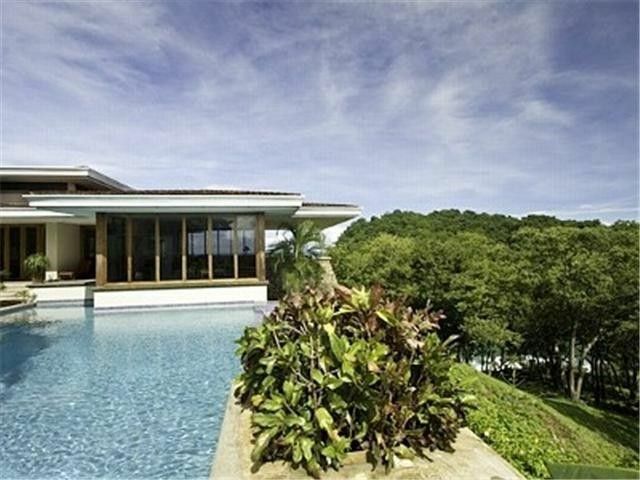 This home guarantees a complete private vacation. It offers daily maid and pool service. We can organize a chef and offer you an all inclusive vacation as well. The home has wifi internet. This is a one of a kind home and you can enjoy from each terrace or balcony a fantastic view over the ocean. This home is built to enjoy a group stay but as well there are enough spaces to enjoy privacy. In bedrooms only. The living area is cool because of the ocean breezes and ceiling fans through this area. This house has the most AMAZING views ... 280 degree views of the water with no other”civilization” in the way. Lots of seating areas, and we could always find shade. The property was very clean and well cared for, a live-on-the-premises caretaker who responded instantly to any questions was appreciated. Lots of bedrooms and lots of bathrooms, fully equipped kitchen. The consierge at Tropical Homes was very helpful. The sunsets were magnificent from our house perched on the cliff. Everything as promised ... Highly recommended. We had an excellent week at Casa Los Monos. We had four couples at the house with plenty of space to spread out. The pool was perfect for relaxation and connecting with friends. The maid staff did an excellent job and Reymundo was available to address any of our needs while at the house. The beach trail was not an easy hike for the older folks in the group. Rita and Roxana from Costa Rica Tropical Homes did a great job of setting up the rental and helping us with activities and restaurants. The tour people they recommended were excellent choices. So glad that you enjoyed you stay and got to see some of our lovely country. Thank you for your kind words on our services; they are most appreciated. Please visit us again ! Esta casa esta genial, grande y con mucha tranquilidad. Casa Los Monos is Unbelievable! This house is HUGE and really does have gorgeous sweeping views. Due to the way it is situated on the point between Potrero and Flamingo we were able to see the sunrise and amazing sunset every day! We were two families with 8 people total, and had plenty of room to spend time together and to find private time alone. The caretaker Raymundo was friendly...he even washed my rental car the morning we left. The housekeepers Myrna and Sunny came every morning and kept the place nice and clean, but never seemed to get in our way. The concierge Roxana made some wonderful restaurant recommendations too, and was easy to contact using WhatsApp. The home has many doors to lock at night and the bedrooms might be too spread out if you are traveling with young children, but it was a perfect layout for us with 5 kids ages 11 through 15. The shared driveway is gated, and there is a separate gate on the private portion of the driveway. We felt very safe. The pool is amazing, and we appreciated that parts of it were in the shade during the peak sun hours. The private beach is amazing too, though it is only accessible during low tide. If we are ever in Flamingo again, expect to find us at Casa Los Monos! The views from everywhere in this house are amazing. Raymond and the housekeeping staff are friendly and helpful! The house is huge with enough room for 10 people, (we were two families of 5) . But the house is worn! We encountered rock hard beds in 2 rooms, ants everywhere, especially at night in the kitchen, bar stools that need replacing, and a scorpion in the living room. The master bedroom had an ant infestation in the whirlpool tub and the shower handle was broken. Many of the screens in the home had holes and were in need of repair. With that being said, we still had a wonderful time. Playa Flamingo is the nicest area and after visiting many of the other nearby beaches, Playa Flamingo was our favorite beach. We ate at Marie's, the Beach House, Coco Loco, Sugar Beach Hotel, and the Monkey Bar. They were all great! The rental company, Tropical Homes of Costa Rica, was not as helpful with their advice. They offered a shuttle service for 10 from the airport for $200/each way. I found another company, Tucan Tours, for $100. And they were great! Once we arrived at the home, we wanted car rental. They recommended, Adobe. But we found them more expensive. We used National Car rental, which Tropical Homes told me was based out of Brazilto, but was actually located in Playa Flamingo, and delivered the cars to the home at no charge. We took the Lazy Lizard catamaran tour. We found it a bit crowded and the snorkeling was not so good, but the ride and finding the dolphins made it memorable. We also did the Congo Trail Zip line tour. Which was a very bumpy ride to the destination, 4x4 recommended, although we did make it with a car. But it was well worth it. The zip lines were cool and seeing the monkeys was amazing! Would I go back to Costa Rica? I think so. Would I rent this house again? Probably not. Thank you for your review Jennifer. Your input will be forwarded to the Owner. Unfortunately, the tropical environment of Costa Rica does come with insect problems, and we apologize that you experienced ants and a scorpion. It does sound as though you and your family rose to the occasion and were able to enjoy the beaches, and some of our natural wonders, and animal wildlife. The house is beautiful and the location is perfect. There are a few things that I didn't like but there is always something not to like about any place. The pool doesn't get enough sun in January. Maybe other months it would be better. The pool is beautiful and the waterfall is great. The people taking care of the house are the best. Very nice and they do a great job. The grounds are well kept. I like the security of the gates and Raymond keeps a watchful eye. Each bedroom has its own area away from the other guests. Very private. The main level is great for entertaining. I would recommend this house to my friends. The house was great for my group. There were 6 adults in my group so we had plenty of privacy. The restaurants in the area were great. We didn't have a meal that wasn't great. Marie's at the bottom of the hill in Flamingo is my favorite breakfast place.